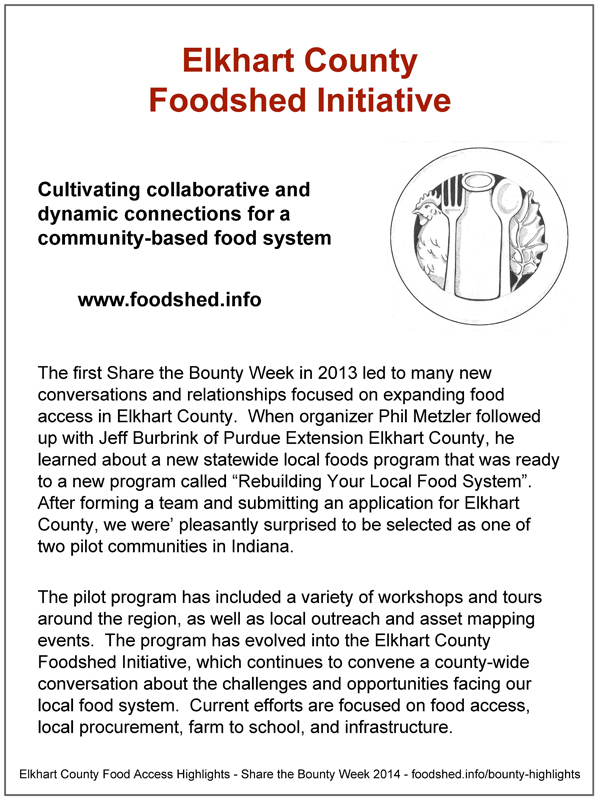 To roll out the new "Rebuilding your Local Food System" program Purdue Extension has selected Elkhart County to be one of two pilot communities in Indiana. A robust local food system with year-round markets is paramount for agricultural producers working to meet the high demand for locally grown and produced food. The popularity of local food is evidenced as direct sales to consumers doubled for Indiana growers in the past 20 years, and the number of farmers’ markets doubled in the past three years (Indiana Agricultural Statistics 2011-2012). However, sustained growth for local food cannot be solely maintained with seasonal farmers’ markets alone. Indiana imports an estimated 90+% of its food from out of state, yet the Hoosier state has the tenth largest agricultural economy in the US. Hoosiers spend over $17 billion annually on food, with nearly half of all food dollars spent eating out. Currently, few resources exist for large volume buyers to source locally grown food, even though strong commitment and high demand exists among institutions, grocers, and restaurants. Intentionally developing local food systems will grow the state’s economy by capturing a higher proportion of food dollars, which are currently leaving the state due to a lack of infrastructure. This new extension program, Rebuilding your Local Food System, will enable communities to better understand their local food system, engage multiple groups in a dialogue about rebuilding their local food system, and assist with strategic planning for implementing their rebuilding strategy. For additional information about the program, contact Jodee Ellett of Purdue Extension (jellett@purdue.edu), Mary Ann Lienhart Cross (lienhart@purdue.edu), or Phil Metzler (phil@transitiongoshen.org 574-349-7336).